You have decided to take the leap and hire a professional photographer for your family photo? Great move, and thanks for taking the time to look at our family portrait portfolio! Did you make a decision on what type of images you’d like to have? Something traditional? A lifestyle shoot? Or maybe you're willing to invest the time and money on an artistic shoot? Creative family portrait, a Christmas gift for dad. Falmouth, MA. We'd love to talk to you about what makes sense for your family, and go through some of the options we offer. A traditional photo shoot and a lifestyle shoot tend to take less time. We will spend about an hour and a half photographing your family and then edit the photos. Traditional beach family portrait, Rockport, MA. An artistic photography shoot is a greater time and financial commitment for you and for us. Artistic family portrait, Cambridge, MA. - There is no sitting fee. - You do not have to buy prints or photography products from us. - You will get all the files with no watermarks and will be able to use them to print. Initially, our photographer will shoot about 100-300 images of your family (depending on the number of people being photographed). 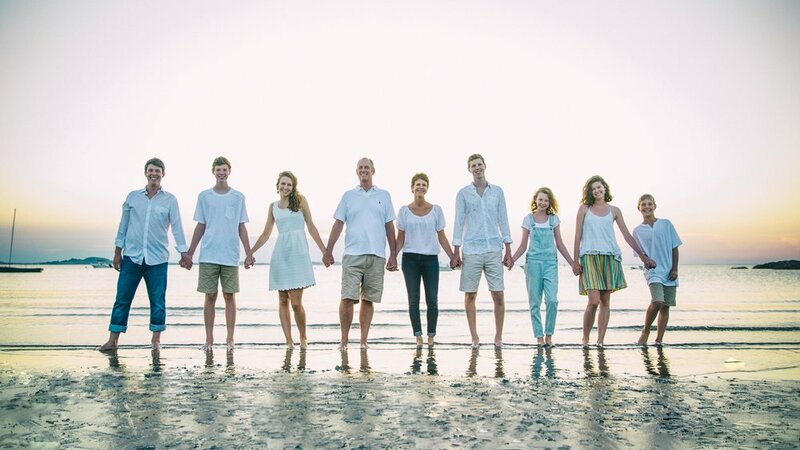 For a large family, this will include a group portrait, individual family group portraits, and other family group combinations (for example, all the grandkids and the grandparents, all the siblings and their parents, all the women or all the men in the family. For a smaller family, it might include all the kids, just the parents, the kids and the dog….whatever works for you!! Typically, the shoot takes about an hour. Modeling is hard work. Having your picture taken, even with members of your own family, which is usually quite fun, can get tiring after about an hour. After we're done with all the photography, our photographer and editing staff will go through and select the best images and edit them. Most photographers only retouch their images. We fully edit the photographs, as, inevitably, someone will have their eyes closed, a small child will have their hand in their mother’s face, or someone will have a strange smile on their face. We will go through and often move parts of the images around to make sure everyone looks their best. As a former fashion photographer, Ivan Djikaev, our chief photographer, supervises the photo editors, thus ensuring, that the same techniques that would be applied in fashion photography are used in our portraiture work. His attention to detail will ensure memorable and artistic photos of your family. As a final work product, you will have about 70 fully edited, high-resolution files for you to download from a file exchange server. You will also receive the low-resolution files that you can post online. None of the files will have watermarks and you will be able to use the high-resolution files to print the photos.